All Test Kits Testing the chemistry of your pond water is important to ensure it's clean, clear and healthy. Use test kits and test strips regularly to monitor healthy conditions for your fish. The new API Pond 5-In-1 Dip Strips provide distinct variations between colors on the color charts for Easy-To-Read results. The desiccant liner on the container keeps the strips dry, maintaining product stability and extending the shelf life. Part of a complete testing lineup from API Pond! Highly precise color charts - No separate test vial required - dip strip directly into the pond. Easy-To-Read directions and product recommendations. Measures: pH, Nitrite, Nitrate, Carbonate Hardness & General Hardness. Tests for ammonia levels in water. Fish continually release ammonia through their gills, urine and solid waste. Uneaten food and decaying organic matter also add ammonia to the water. Even small amounts of ammonia stress fish, and large amounts will cause fish loss. Use this kit to easily and accurately measure the ammonia level in your water so that you can take the necessary steps to remove ammonia and keep your fish healthy. 2 liquid dropper bottles with child-resistant safety caps, easy-to-read instructions with information on how to test and how to correct unsafe water conditions, 2 color charts and glass test tube with snap-tight cap. ML/KH may slightly increase pH; adjust as necessary. Maintain 100 ppm KH at all times to assure nitrification. liquid dropper bottle with child-resistant safety cap, easy-to-read instructions with information on how to test and how to correct unsafe water conditions, color chart and glass test tube with snap-tight cap. A common treatment for parasitic infections, copper in an aquarium must be monitored. A low copper level could make the treatment ineffective. A high copper level could cause fish death. liquid dropper bottle with child-resistant safety cap, easy-to-read instructions with information on how to test chart and glass test tube with snap-tight cap. Sensitive and accurate test kit for measuring dissolved or chelated copper concentrations in ponds and aquariums. The Aquascape Cu/Copper Test Kit provides laboratory quality testing that is simple and easy to use. Copper is often used as a medication or pond treatment. 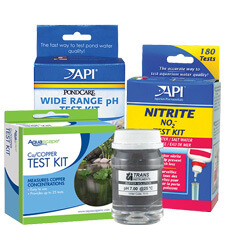 The Aquascape Cu/Copper Test Kit is also ideal for testing tap or source water for copper. For use in ponds, marine and freshwater aquariums. Provides up to 25 tests. Quickly and accurately evaluates water quality, allowing for detection of minor pH changes and the avoidance of major problems. pH levels are affected by fish waste, rainwater runoff, organic waste, the mineral content of tap water, and a drop in oxygen levels. Dropper bottle for accurate dispensing of test solution. Easy-to-read instructions and color chart. Non-staining glass tube with snap-tight cap. A complete kit for testing pond water. Product conducts over 500 tests, and is compact and convenient for easy home storage with 6 bottles of liquid test reagent, laminated color cards, 4 glass test tubes, and a complete step-by-step instructional booklet. Phosphate can enter the aquarium through tap water, fish waste, and decaying organics such as uneaten food and dead algae. Excess phosphate contributes to unsightly algae and green water blooms. In saltwater, excess phosphate can inhibit the growth of hard corals. Step by step instructions and information on how to correct unsafe conditions. Includes 25 of the 6-in-1 Testing Strips and 25 of the Ammonia Testing Strips. So, this kit will provide the testing of ammonia, chlorine, nitrates, nitrites, general water hardness (GH), alkalinity (KH), and pH levels. Trans Instruments Koi Medic Salt Meter and pH Meter are back by popular demand! One of the best and easiest meters for checking your salinity and pH.